Members of the Developing the Young Workforce Dundee and Angus team got to go on a bit of road trip recently. On Friday 10th August Ross, Rachel and Lottie from the team had the opportunity to present to the second year Aldi apprentices from across Scotland at their Enrichment Day at the Scottish headquarters in Bathgate. Emily Hutchinson, the Store Operations Area Manager, has been working with the team on other projects recently and was aware of their well respected and positive Apprenticeship Ambassador programme. She thought this would be a good development opportunity for the second year apprentices and an inspiring addition to the day’s programme. With brief in hand and a PowerPoint prepared the team set-off for Bathgate. Lottie, the DYW MA and regular Apprentice Ambassador (she has been involved in every event we have co-ordinated) attended as well to illustrate exactly what Apprentice Ambassadors is all about and the impact it can have. 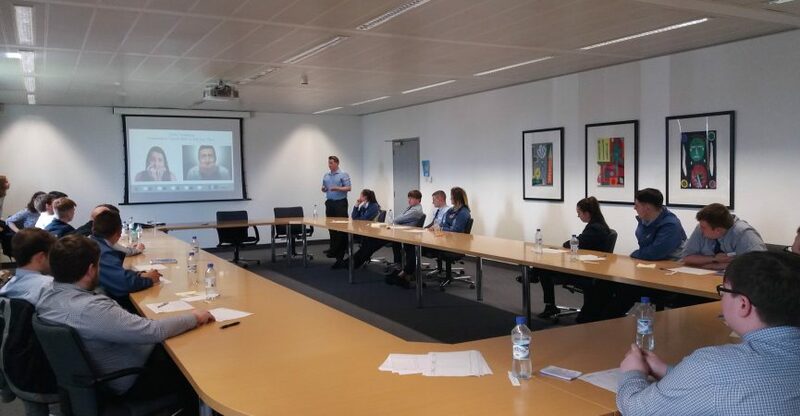 Delivering a mini-version of an Apprentice Ambassador session to the Aldi apprentices, so they could see what it was we did and what they could sign-up for themselves. Part of this session was Lottie discussing how much her confidence has improved due to her time as an Ambassador and how this has helped in her job on a daily basis. After this interactive introduction the team engaged the apprentices in activities that allowed them to think about their own journey; how far they had come as individuals and how to contextualise that both as part of a bigger picture and as inspiration for other people. This method of organising their thoughts and experiences into a logical progression with actions and outcomes is a technique that the apprentices now have for life and will be able to apply to other situations. Leading straight into a session exploring presentation techniques; not only how to engage an audience and deliver a good presentation, but also how to recognise and deal with the nervousness and physical side-effects we all encounter when speaking or presenting. Again these are skills and knowledge which will stay with the apprentices throughout their career journey. The day was rounded off with a more detailed look at what Apprentice Ambassadors and its aims are. There is an awareness that apprenticeship pathways are often not well known or promoted in schools. Apprentice Ambassadors is a positive and engaging way to address this; young people speaking directly to pupils about their experiences and illustrating with personal stories what possibilities and opportunities exist. The programme is also a positive for employers, the apprentices who are trained as ambassadors gain more experience and opportunities to develop their soft skills, specifically communication and their confidence, useful in every industry. But it’s also a chance to make pupils aware of the apprenticeship programmes and pathways an employer has available and leave a good impression with potential future recruits. The DYW team left the Aldi Enrichment Day on a positive; they had given 19 young people from across Scotland new tools to help them throughout their career journey. Since the event a number of the apprentices have been in touch to enquire about being connected to their local DYW and becoming ambassadors in their own area. Apprenticeships at Aldi are about so much more than stacking shelves or serving on a till. Pop into an Aldi store and you won’t see any dilly-dallying. Aldi people know what needs to be done, and they just get on and do it. It’s simple really, but it does take lots of drive. The Aldi Stores Apprenticeship won’t just give young people a great start to their career – it’ll put them on the right road to success. And if they combine hard work, ambition and an ability to apply themselves to any challenge, they could make it all the way to Store Management and receive qualifications along the way.